Rolled porathas, Parathas - Varela poratha | Authentic Vegetarian Recipes | Traditional Indian Food | Step-by-Step Recipes | Give Me Some Spice! Most Indian food is accompanied by rice or Indian breads like chappatis, puris, naan, parathas etc. I learned how to make this version of parathas from my dad. He used to make these Rolled porathas, Parathas – Varela poratha really lovely fluffy parathas for breakfast on a winter’s morning and we are all now addicted to these and love having them any time. 1.Sieve the flour and add in the cumin seeds, garlic, salt and turmeric . 2.Add in the 2 tablespoons of oil and the butter and mix. 3.Using warm water mix the dough. When ready, knead it well so that it becomes nice and pliable. Keep this covered for 20 minutes. 4.Divide the dough into 8 equal balls. 5.Take one ball and roll out the Rolled porathas, Parathas – Varela poratha and brush some oil on one side and dust it with some flour. 6.Try and make a pile by stacking the Rolled porathas, Parathas – Varela poratha as shown below and twist it back into a circle and roll it out again. 7. The oil helps to separate the Rolled porathas, Parathas – Varela poratha into layers. 8. Par cook the Rolled porathas, Parathas – Varela poratha finish off – by brushing it lightly with some oil on both sides of the paratha. 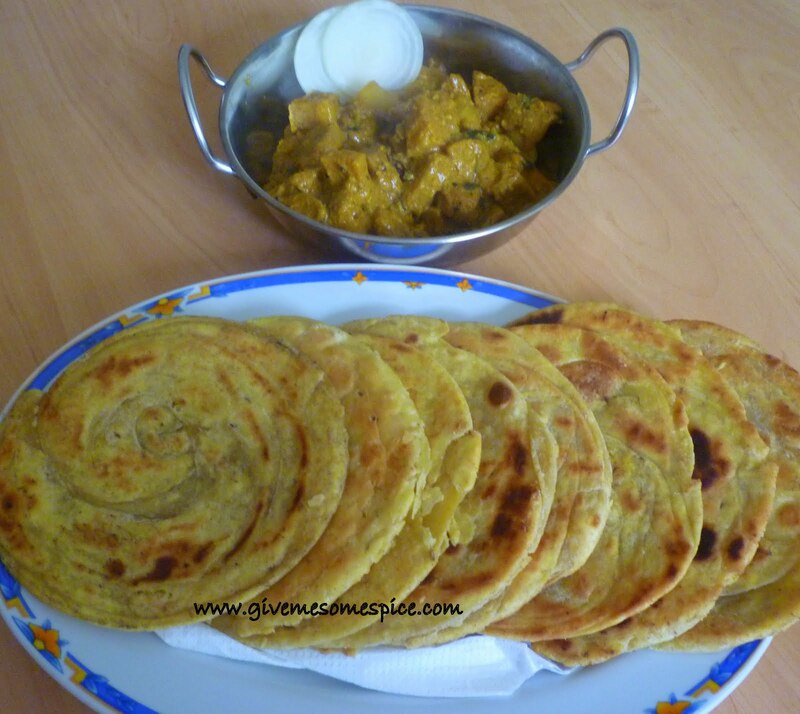 9.Serve these hot Rolled porathas, Parathas – Varela poratha with any curry.